The church is in Politics more than the Politicians. As I have mentioned a few times already in our study of Thomas Jefferson, his principle of the separation of church and State was more to protect the State than the church. It seems that Will understood this also. Unfortunately not much has changed since even Will’s day. The bible says we are not of this world but you couldn’t tell it by the words of some of my conservative Christian friends. They literally hate our president, especially since he has been re-elected. I am told they even voice that hatred when they are studying the Bible together! They should take the message of Buddha from one of my recent posts to heart. The hate they have punishes them much more than anything it could possibly accomplish. Why can’t they drive their hate out of themselves and replace it with the love of Jesus. But then again these times are nothing compared to the post-Constantine period and far beyond that period where the church leaders were literally the politicians and that included judge, jury, and executioner for thousands they deemed as “heretics”. Church history, even including recent history, is messy…. but the messages of Jesus Christ are quite clear if only we listen and actually do what he said. I have hopes that that is actually happening today in the emergent church movement. 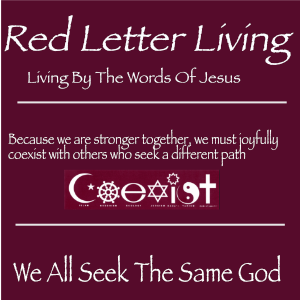 If you want to learn more about that see today’s post at RedLetterLiving.